This non woven bag is lined with foil material to keep temperature down. It is great for dairy and meat products. The measurements are 9" wide, 5" deep, 6" high without the straps. The straps are 8" when stretched. We can make any size for you and print your logo on one or both sides. You can also pick colors from a list of our standard colors.. 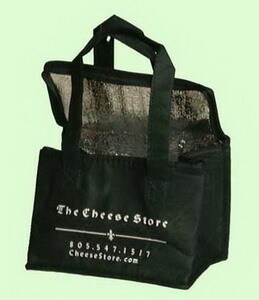 Please contact us by email to bags@coedru.com.